, an English divine, was born about 1604, of a good family, in the parish of Eldsfield, Worcestershire. He entered of Baliol college, Oxford, as a commoner in 1621, took the degree of B. A. in Nov. 1625, in 1628 was made probationer fellow, and in 1630 completed his master’s degree. On the commencement of the rebellion, he travelled into France with William lord Sandys, whose sister, the lady Mary, he afterwards married. Soon after his return he obtained the mastership of his college, Feb. 20, 1650, being at that time bachelor of divinity, and next year took his doctor’s degree in the same faculty. Notwithstanding this compliance with the usurping powers, he was, on the restoration, made chaplain in ordinary to his majesty, prebendary of Gloucester in 1665, and rector of Bladon near Woodstock in Oxfordshire. 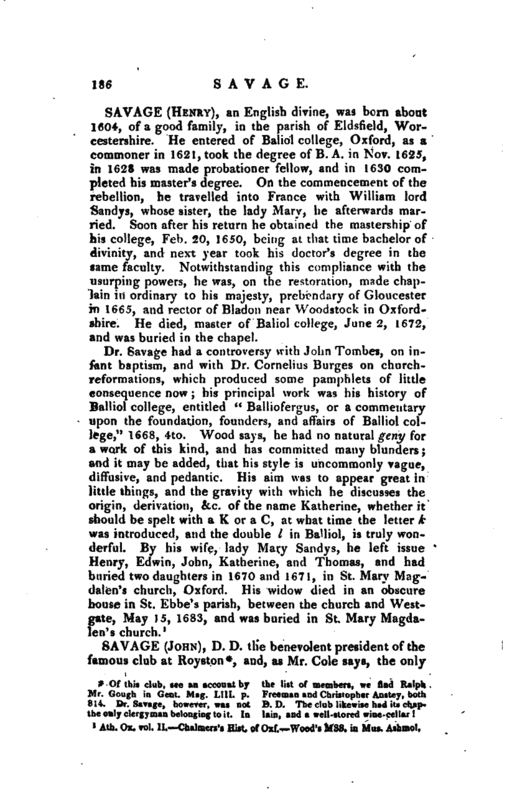 He died, master of Baliol college, June 2, 1672, and was buried in the chapel. Ath. Ox. vol. II. Chalmers’s Hist, of Oxf, Wood’s Mss. in Mus. Ashmole.